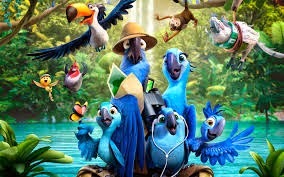 The sequel to the successful 2011 computer animated Rio is once again set in Brazil which aims it's family lesson moments to the ecological awareness of the Amazon rainforest and appreciating your own family unit. Directed by Carlos Saldanha who also did the story with Don Rhymer and screenplay by Yoni Brenner. Blue Sky Studios fills the screen with bright vivid colors that is a feast for your eyes with your 3D glasses. We pick back up with Blu (Jesse Eisenberg), a rare blue Spix's macaw from Moose Lake now living in Rio. His “wife” Jewel (Anne Hathaway) are living happily with their three children Carla (Rachel Crow), Bia (Amanda Stenberg) and Tiago (Pierce Gagnon). Their human friends Linda (Leslie Mann) who adopted Blue when she was 15 and her husband Tulio (Rodrigo Santoro) discover loggers in the rainforest while they are searching for more blue Spix's. When Blu and family leave the city of Rio De Janeiro to look for Linda and Tulio, Blu has to come to terms with his lack of expertise of living off the land in the country. His idea of trekking includes a fanny pack filled with necessities including a GPS that will lead them to his humans. They discover a hidden tribe of Spix's Macaws that turn out to be Jewel's family who she lost when she was captured. Andy Garcia voices Eduardo Jewel's father who is thrilled to find his daughter and meet his grandkids. He's not that impressed with Blu. He would prefer Jewel's childhood friend Roberto (Bruno Mars) who quickly becomes a uncle figure to the kids. Blu's friends also came along on the adventure hoping to find some talent for their big Rio show. There's George Lopez as the toucan Rafael, Jamie Foxx as Nico the yellow canary, and will.i.am as Pedro a red crested cardinal. Nigel (Jemaine Clement) a sulpfur crested cockatoo can't fly anymore after the adventures in the first movie and is set on seeking revenge on Blu. He manages to follow the intrepid family when the travel the river by boat with his sidekick Gabi (Kristin Chenoweth) and poison dart frog and the bull dog Luiz (Tracy Morgan). There are many stories running at the same time with Blu trying to impress his father in law while he is totally uncomfortable outside the city. Jewel likes living back in the forest and thinks they should stay for the kids sake. There's the border battle between the red birds and the blues over the Brazilian nut trees. Then the loggers coming in can cutting down everything in it's path, while Linda and Tulio try to stop them. Not to mention Nigel getting sidetracked from his plans when he's asked to audition for the Rio show. And it's all united by a few musical numbers, the best being the torch song of Gabi, the frog who loves Nigel. It's a movie that has a little bit of everything to entertain the kiddo's who have attention deficits and parents who may snooze, but not miss anything important. Fun family movie with engaging characters and lots of famous voice talents like Rita Moreno as Mimi Eduardo's older sister.